Credentials of Master of Music pianist and teacher Monika Kasprzak who has over 25 years experience teaching hundreds of students and performing. Monika Kasprzak is a pianist of the highest calibre who she has been passionately pursuing excellence in all styles of piano perfomance her entire life. A highly qualified professional instructor with a knowledge of serious classical repertoire, what sets Monika Kasprzak apart from other classical piano teachers is her experience in performing many other genres from a very young age. Also as a practicing professional with over 30 years experience performing classical as well as current music, light jazz; piano solos and duos, as well as ensembles, symphony orchestras and choirs, she can incorporate all of these varieties of music into your music education. With over 28 years experience teaching hundreds of students, a number of them continued music in higher institutions and pursued music as a career. A recording artist, her solo piano CD "A Steinway Christmas" was nominated and awarded with a Best of the Year 2013 Runner-up on SoloPiano.com internet radio. 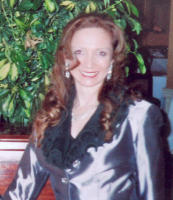 - CD Recording Artist with a nominated and Runner Up recognition at SoloPiano Internet Radio for her solo piano CD: "A Steinway Christmas"
- performances in 28 cities in Canada and United States including venues Roy Thompson Hall, Jane Mallet Theater, also on CJRT and CHIN radio and for numerous dignitaries and VIP's. - she has been continually honing her skills by listening only to the world's best pianists and musicians of many genres and also taking online MOOC courses by Coursera as well as observing Master Classes by many world's greatest pianist/teachers. Most recently, she received 92% in Gary Burton's "Introduction to Jazz", 93% in Jonathan Biss' famous "Beethoven 32 Sonatas" MOOC classes and 100% in 'How To Write Like Mozart"
- she has completed "The Art of Teaching Theory Grade 5 " and "The Art of Teaching Theory Grade 8" webinars offered by the Royal Conservatory as a teacher update with the brand new Theory curriculum of the latest Syllabus in November 2018..
Luckily piano was taught to her since the age of 6 in a musical family where musical training was a part of her daily life as she spend her entire childhood and teen years studying practicing and performing piano music, attaining Grade 8 at the age of 12, Grade 9 at the age of 13, Grade 10 at the age of 14 and A.R.C.T. Piano Performer's Practical at 16 with the completed Theory Co-Requisite requirements at the age of 17. Additional musical experience during her high school days included playing piano/keyboard in Bigh Band Stage Bands for 4 years; and being the piano accompanyist for the junior and high school choir's Musical Productions 3 times starting at the ages of 12; as well as playing clarinet in Concert Band orchestras for 7 years. A bonus unparalleled level of training came with performing Piano Duo's and Duets since the age of 12 with her sister in a multi-award winning journey often attaining marks of 94%, 96% and 97% in festivals. In Piano Duo playng there is a necessity to have a complete mastery of the instrument in order to be fully prepared for the added element of unknown with another person. She took all of this knowledge into practice when at the age of 20 she took her first of many jobs playing in restaurants. There she was able to incorporate and fuse all of her musical and pianistic knowledge into playing for 3-5 hours of arrangements of music and compositions of all styles from classical, light classical, jazz standards, broadway musicals, popular, contemporary, light jazz, classics from the 1920's. 1930''s and each decade, into artforms and elegant cocktail piano stylings. Having studied and been inspired only by the world's greatest pianists and musicians of numerous genres she has devoted over 30,000 hours of practice and experienced over 12,500 hours of performing piano. Where 10,000 hours is the minimum amount of time required in many activities to reach the level of mastery, she has highly refined rare skills in playing, interpreting, comprehending and teaching piano. Having taught students in the hundreds, she is proud to instill her passion and knowledge of one of the most amazing art forms to our next generation.